Haven’t phenomenal new oil discoveries been made lately in the U.S.? Shouldn’t a huge positive supply shock like that simultaneously increase the real expected return for U.S. businesses (lower COGS) and put downward pressure on inflation expectations at the same time? Simple answer: Housing prices (not included in CPI inflation) have bottomed out. Your theory seems doubtful. Shouldn’t a bottom in housing result in increased expectations of future core inflation? Housing prices are not included in either headline or core CPI inflation. Instead owner’s equivalent rent is used. Owner’s equivalent rent is calculated based upon rental costs. And so if more people are buying houses and fewer are renting, that would put downward pressure on the CPI (the inflation component of TIPs). Whoops, thanks for setting me straight. I was thinking of some kind of positive wealth effect from higher home prices that motivates people to buy more stuff. But as you point out, that factor is probably outweighed by lower rental rates. Speaking of that working paper on the Fisher Effect…I still think you might want to give reference to an article detailing the history behind it, David Glasner. In case you weren’t aware, Robert W. Dimand and Rebecca G. Betancourt had an article on the history behind the Fisher Effect published in an issue of the Journal of Economic Perspectives in 2010. As for whether the American economy as a whole is finally making a solid and strong recovery (and not to mention the global economy at large)…it’s stil too early to say. While the stock market might genuinely be signalling a strong recovery, I can be overly cautious, and by the time I realise that the recovery in America is finally turning solid and for real, it shall be too late. Brilliant blogging. This is right! But! That is why the Fed has to be very aggressive in pushing for growth now. It has to pour it on, and say it will pour it on, and then pour it on some more, and say it will pour it on some more. This could take years of QE. I wonder if a 3 percent inflation target is better. Really, what is the peevish fixation on minute rates of inflation…I think you have to be a Phd economist to give a hoot whether inflation is at 3 percent or 2 percent….. I find prosperity is a better life than monetary asceticism…..can we just have some boom times and Fat City? 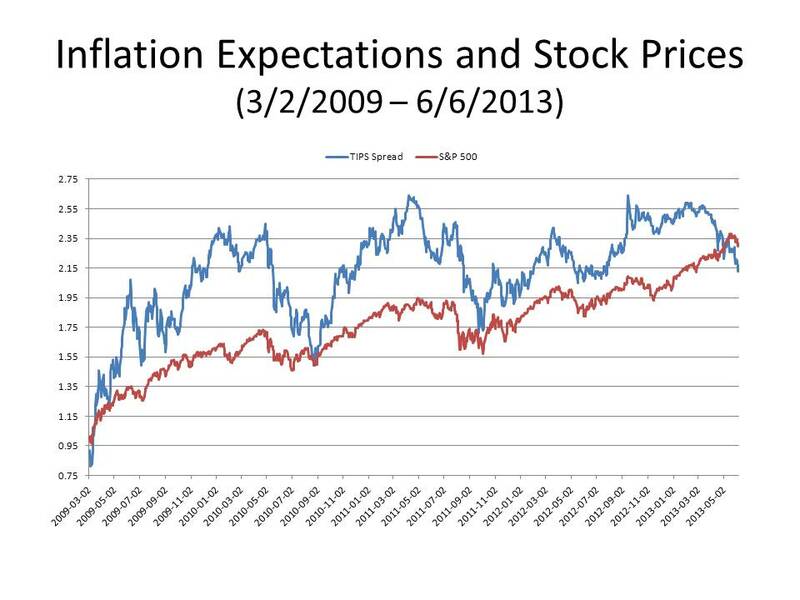 George Selgin model say that you can have deflation and at the same time the economy doesn’t feel pain. You raise some good questions. 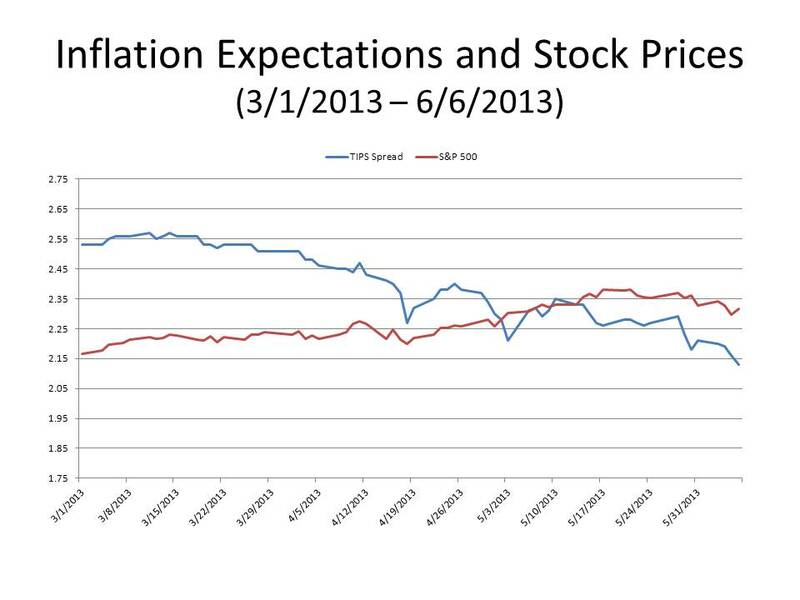 The “rising optimism” explanation for real rates is congruent with recent stock market moves. However, that thesis fails to account for the last four years of rising stocks and falling real rates. Further, there seems little actual evidence to support the “optimism” explanation. Global growth is slowing. The data in the U.S. has been decidedly mixed: We have better consumer sentiment, a slight pick up in job growth, and a housing bounce. These are offset by a sub-50 ISM, falling manufacturing employment, flat hours worked, flat durables orders YTD, etc. Indexes of “macro data surprises” have been consistently falling for months. We are focused on expectations, but clearly, nothing in the incoming data supports a dramatic change–a tipping point–in expectations versus the past four years of falling real rates. Conclusion: The data does not fit with most broad economic theses regarding the real rate. The answer seems obvious to me: both have been stoked by what’s happening in monetary policy and after all this time speculators have realized that QE doesn’t impact the stock market in any way other then effecting the expectations of the speculators themselves.